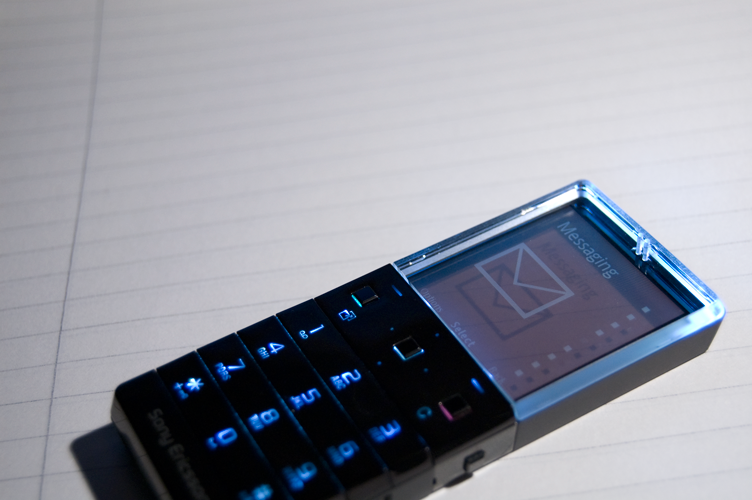 UPDATE: It seems the phone has finally been released, under the name of Sony Ericsson Pureness. Looks cool! The first thing about the new Sony Ericsson XPERIA X5 (just X5 in short) you will notice is the display. Not only does it sport the usual you’d expect from Sony Ericsson – high resolution and crisp, clear pixels – but the display itself is transparent! It’s like looking through a piece of tinted glass, except for the fact that the piece of glass can display text, images, videos and even games! The only major downside to it is the lack of colors, although I personally am not missing it too much. The rest of the phone consists of a glossy black keypad, all in one piece except for the lines dividing the numbers and the Call, the center and the Cancel buttons. When lit up, the three mentioned buttons glow with a green, white and red light respectively. The + and – volume buttons are placed one on each side, in line with the three main buttons. On the sides there is also the power input and the SIM-card slot. On the back side of the phone the back side of the display is visible (which you of course can see through) and the small power button. What’s interesting about the XPERIA X5, apart from the display, is the way it handles battery and storage. The X5 features a built-in media-storage module of up to 2GB’s – enough to fit more than 500 standard-sized MP3’s – and a built-in regular storage of around 100MB’s. It also has, in contrast to most other phones, a built-in battery. I suspect the reason Sony Ericsson chose to build the battery inside of the phone was to avoid the extra cost and vulnerability of a battery cover. Although the X5 lacks a camera, it’s a great mobile phone. The design of the outside, not to forget the design of the menus inside the phone (!) gives a very luxurious impression and modern impression. Most, if not all, standard features are there (such as Bluetooth, radio, synchronization, music player and fast 3G internet). Thanks to its design, the X5 is very light weight and small, it can be used by a lot of different people with different lifestyles. I love this phone. Sure, the lack of colors can be annoying at times and it sure would be fun to have a built-in GPS and WiFi internet. But for anyone, ranging from businessmen to simply every-day users, the Sony Ericsson XPERIA X5 is a great phone. Just wait until it reaches the markets, I guess!